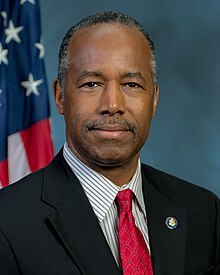 The United States Secretary of Housing and Urban Development is the head of the United States Department of Housing and Urban Development, concerned with urban housing matters. The Secretary is a member of the President's Cabinet. Ben Carson is currently serving as Secretary. On January 13, 1966, Robert C. Weaver became the first African American Cabinet member by being appointed to the position. ↑ "3 U.S. Code § 19 - Vacancy in offices of both President and Vice President; officers eligible to act". LII / Legal Information Institute.